If you are new to the literature on prison education...welcome! Online indexing and retrieval capability are an important part of our aspirations to make this material as available as possible to interested educators and researchers. In collaboration with scholars and practitioners across a variety of disciplines, the Center is currently in the process of building two research bibliographies to serve as important resources for people interested in incarceration. The first will cover contemporary research in prison education, with a focus on social justice-oriented approaches. The second will cover research on the experiences of queer, trans, and gender non-conforming people in the criminal legal system. Stay tuned for the first version of these resources to appear in late spring 2019! Articles - A short collection of some of the many articles authored by Center faculty. Images - This page displays some of the images from the Center's correctional education and prison reform collection. Literature - A collection of historical texts in the field of prison education. 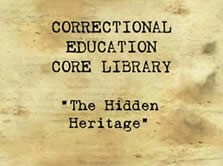 Core Library - An annotated bibliography of texts in the field of prison education. Many of the books are out of print and can be extremely hard to find. The Center has obtained the necessary permissions to make available photocopies of these books. Satellite libraries are placed in institutions to facilitate teacher development and are gaining in popularity. If your institution would like to obtain a core library, the Center would be happy to help. Contact us for more info.